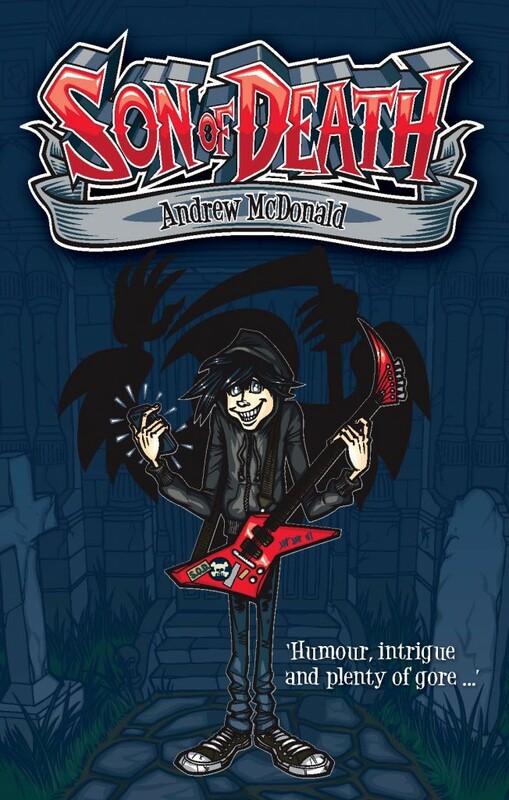 Full of black humour, Son of Death is a rollicking tale of mystery and adventure. Meet Sod (aka Son of Death) who discovers that his parents are grim reapers and that he is a reaper too. But still, grim-reaping is a chore for Sod. Every day after school he’s expected to guide souls into the afterlife. And it’s really going to get in the way of playing guitar with his band. 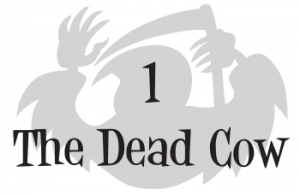 But when he starts neglecting his grim-reaping duties things go awry in the universe. It’s up to Sod, and his new goth friend, Graveyard Girl, to work out how to put things right again. Sod woke up with a groan and a sore face. He lifted his head and rubbed his cheek, feeling the long, thin indents on his skin. Guitar string marks. He’d used his electric guitar as a pillow again. Every night Sod stayed up late, way after his parents had gone to bed, playing guitar and filling his bedroom with thunderous riffs and chords. At nine his dad always made him plug his headphones into the guitar amp, but Sod kept on playing until he got so tired he collapsed. He moved his guitar and sat up in bed. On the wall opposite him was a poster of the greatest band of all time, Acidic Vomit Spray. All three band members were flaunting ripped shirts, cowboy boots and square jaws. The lead singer was Julius Manflake. Rock god Julius, who sang like an angel and acted like the devil. He answered all questions the exact same way. Julius Manflake, how do you feel about your band’s new number one album? Julius, how does it feel to be the most popular rock star in the world? Julius Manflake, what is your advice for aspiring musicians? Julius was right. Ordinary life was whatever. But music was forever. Music was life. Sod had saved up all his pocket money a few years ago and bought himself an electric guitar from a secondhand music shop. He’d called the guitar Julius Manflake after his idol, and not a day went by when he didn’t play it. Sod dragged himself over to his desk. He picked up his phone, flicked to the camera and looked at himself. Who needs mirrors anymore? he thought. A scruffy kid sporting a wrinkled black T-shirt and massive bed-hair stared back. Sod smiled. He’d already got the rock look right today. Then he saw the time. School was starting in ten minutes. He grabbed his school uniform off the floor – blue pants, blue shirt and a blue blazer, as if Williamsburg College was a school for Smurfs. He put on the uniform, packed Julius Manflake into his guitar case, grabbed his bag and ran out of his bedroom. Sod’s mum was in the kitchen, cooking a steak. ‘Morning!’ she said cheerily, waving a pair of tongs at him from the stove. After working night shifts at the hospital, Sod’s mum always came home and had dinner for breakfast. Sod wrinkled his nose. Dead cow was not exactly breakfast food, but his mum loved it. He grabbed an apple from the fruit bowl and shoved it into his bag. ‘You’re running late again, Sod,’ said his mum. Sod wasn’t actually his name. His real name was Clarence Danforth. Apparently his parents had called him an adorable little sod as a baby. As he grew up that became little sod. And finally he was just Sod. The nickname stuck. Not that Sod minded. It was better than being known as Clarence. And a lot more rock and roll too. ‘Yeah. Where’s Dad?’ he asked. His dad was usually still home in the morning, dressed in his customary black turtleneck sweater and reading the newspaper aloud. He liked to keep Sod and his mum in the loop on all the hurricanes and famines and wars around the world. Sod nearly asked why, but thought better of it. The answer would probably be boring, because his dad’s job was boring – he worked at the local tax office as an auditor, whatever that meant. Sod had never paid much attention, but sometimes he wished his dad had a cooler job. Like music producer or guitar technician. ‘Uh-huh,’ his mum said, with a knowing grin. Sod looked at his mum’s steak in the pan. A small pool of blood was forming on the top of it. He knew his parents were a bit intense. But that’s because he was an only child, and there weren’t any brothers or sisters or drunken uncles to annoy them. It was just him and his parents. His mum flipped the steak over and it sizzled like crazy. Only vampires got that excited about blood. Vampires and Sod’s mum. ‘I gotta go,’ he said. But Sod was already out the front door. Williamsburg College wasn’t far from home – five minutes if Sod ran. He was running past the row of shops just around the corner from school when a sudden sharpness in his chest forced him to stop. He bent over and put his hand on his heart. Normally he could run the whole way to school, but today his heart was beating unusually fast. Something made him glance across the road at the cupcake shop. Karen’s Kupcake Kitchen. Sod stared at it, feeling weird. He’d never been inside. His mum had always said that cupcakes were an unnecessary extravagance. And, even if she had approved, cupcake shops weren’t a cool place for rock musicians to hang out. He wasn’t running anymore yet his heartbeats were getting faster and stronger, like his heart wanted out of his chest. Maybe I want a cupcake? he thought, feeling odd. From across the street, he could make out two figures through the front window. A woman in a light-blue apron was standing behind a counter. She was talking to a man wearing a brown bowler hat and a purple jacket with his back to Sod. Sod felt a stunning vibration in his body, like his blood was suddenly racing through his veins. He spun around but there was no-one there. He could have sworn someone had just whispered behind him. The whisper came again. Sod did a 360-degree turn before realising the voice wasn’t coming from anywhere on the street. It was coming from inside him. Blood was rushing in his ears, imploring him: Go over there. Look in the shop. It’s happening! Sod looked over at the shop just as the man reached across the counter and touched the woman’s shoulder. Was that what his whispering blood had wanted him to see? A man tapping someone’s shoulder? What was up with that? Shaking his head, Sod took out his phone and checked the time. School had started. He had to go. He put his phone in his pocket and glanced back at the shop. Straightaway, he knew something was wrong. The shop was empty, and the man was suddenly halfway down the street, walking in a brisk, yet familiar, way. Sod’s blood had never talked to him before. He didn’t feel like he had any choice but to obey. In a flash he was outside the shop. He cupped his hands to the window and peered inside. The woman behind the counter – Karen? – was nowhere to be seen. Cautiously, he reached for the door handle. It was locked, despite the sign on the door saying OPEN. This would have been enough to convince most people to give up. But Sod knew how to deal with locked doors. Not that he really thought about it. A safety pin here, a plastic card there could get him into most places. He could have been a burglar if he’d wanted, but a life of crime never really appealed, so he saved his skill for special occasions. He took his library card out of his wallet, slid it between the door frame and the door, and swiped it past the locked handle. The lock clicked and the door swung open. Sod walked in, a little bell ringing above his head as if to say hello. The place felt eerily empty. There were no customers at the few tables and no other staff members. Sod slowly approached the glass counter. It was crammed with colourful cupcakes and fancy labels saying Red Velvet and Hummingbird Carrot and Frosted Jaguar. Where was the woman he’d seen? He approached the counter, peering cautiously over the cash register. There, on the floor, was an arm. His heart skipped a beat. Sod leaned over even more and saw that the arm was attached to a body. And the body was wearing a light-blue apron. It was the woman. Lying on her back, completely still. She looked like an alien wearing a bad human disguise. Her neck was red, her face was pale and her lips were blue. She was staring with her eyes wide open at the ceiling and her mouth hung open, like she was saying ahhhhh for a doctor. But she wasn’t an alien or a doctor’s patient. She was dead. He’d never seen a dead body before. Sod’s stomach turned in a way that suggested a vomit might be next. Stumbling back from the counter, hands shaking, Sod realised his blood was no longer pumping hard. Backing away, he did the only thing he could think of: he threw open the door and bolted down the street. As far away from the corpse as he could possibly get. Behind him, the little bell in the doorway rang as if to say goodbye.